Officials investigate a crash that involved an SUV, a paratransit bus and a SEPTA trolley at South 41st Street and Chester Avenue in West Philadelphia on Tuesday, Feb. 5, 2019. Thirty people were injured Tuesday in a crash involving an SUV, a paratransit van, and a SEPTA trolley in West Philadelphia, officials said. None of the injuries immediately appeared to be life-threatening. 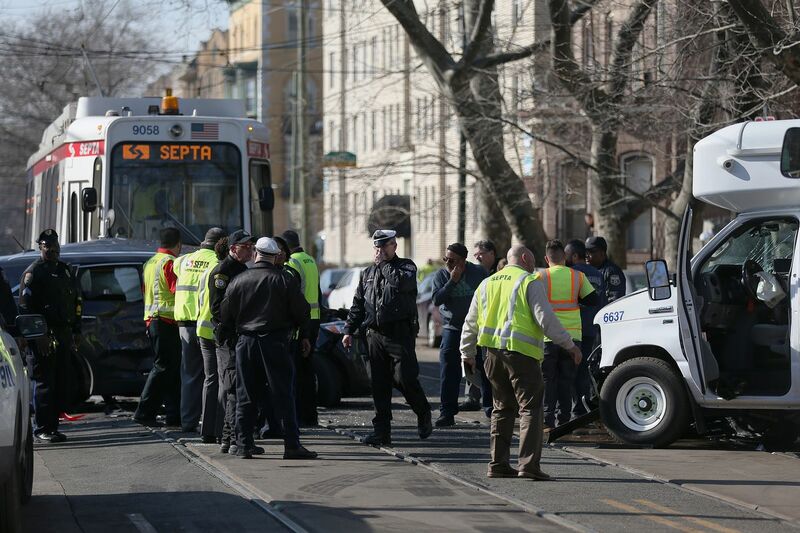 Heather Redfern, a SEPTA spokesperson, said the crash occurred about 11:25 a.m., when the SUV and a CCT paratransit van with only the driver aboard collided at 41st Street and Chester Avenue. The passenger vehicle then ran into a Route 13 trolley that was headed toward Center City. The injured included the driver of the SUV, the paratransit driver, the trolley operator, and 27 trolley passengers, Redfern said. Philadelphia police are investigating the crash. The crash forced the closure of the Center City trolley tunnel. Trolley passengers were advised to use the Market/Frankford Line to get in and out of the city, boarding at 40th Street to get in and 13th Street to leave. Can kids stop their parents from driving distracted? Philly advocate aims to bring lessons to schools.